Actual power is 1300mAh, which is 23.53% LESS than P100, not 40% more than P100 as claimed! Looks like Ryobi has finally updated the P103! Today I tested one with date code CS1217 at well over 1300mAh. Looking at the label, I see that it's rated 28Wh -- all the P103s I've seen before now have been rated 24Wh. That's 16% more energy and means that Ryobi must be using 1500mAh cells in their latest batteries. I've tested hundreds of P104s and NEVER had I seen one test at or above 2400mAh. Until now. This week I received a batch of P104s with date codes between CS0938 and CS0950. With the CS0948 date code it seems that Ryobi has made a change for the better! All of the P104s I've tested with date codes CS0948, CS0949 and CS0950 have tested ABOVE 2400mAh, as high as 2619mAh! I haven't cracked one open to confirm, but suspect that they're now using the same Samsung 1300mAh cells as the P103, for a 2600mAH P104 pack. In addition to the newer date code, I've noticed that the newer packs indicate "45Wh" whereas the older packs indicate "46Wh" (and even older P104 packs have power rating at all). I just realized that the current crop of P104 batteries are marked 48Wh. 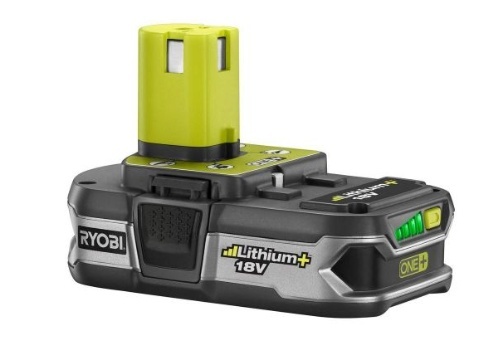 So I'd say that even Ryobi agrees that the current P104 is 2600mAh. This is the battery we've been waiting for! The BIG one! At 4 Amps, it's by far the most powerful One+ battery! 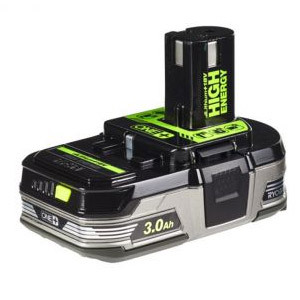 2.0Ah half-height battery. No fuel gauge. 4.0Ah full-height battery. With fuel gauge. 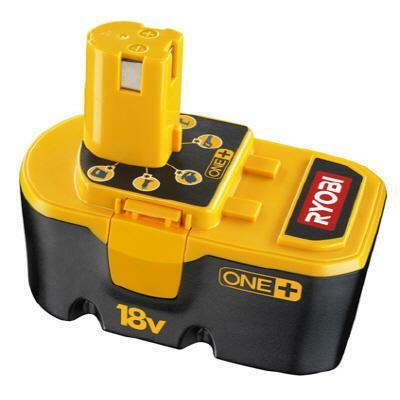 NOTE: Ryobi also sells batteries in kits labeled P101, P106, P109, P122, P170, P161, P181, P184, and P185. P101 = two P100 batteries, P106 = 2x P103, P109 = 2x P107, P122 = 2x P108, P170 = 2x P102, P161 = 2x P190, P181 = 4x P102, P184 = 2x P105, and P185 = 3x P105. So what do some of the features in the above table actually mean? A battery pack's mAh rating is an indication of how much power the pack has. In general, the larger the number the longer the battery can be operated before a recharge is needed. Unfortunately, many factors influence how long a battery will last after a fresh charge, including battery age, number of times the pack has been recharged already, temperature, the tool used, and other factors. 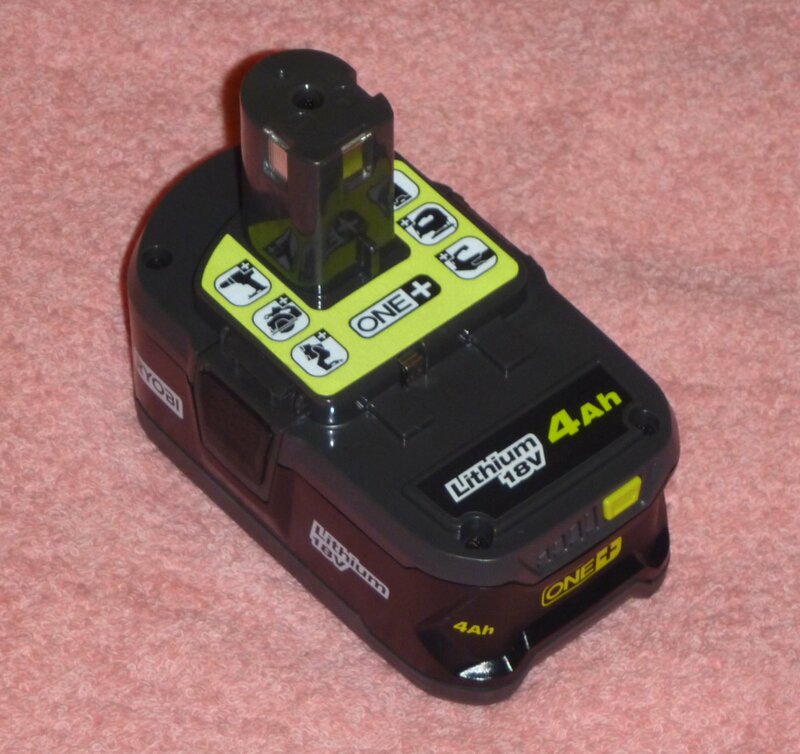 Some of Ryobi's battery packs have an energy ratng on the label, expressed in "Wh" or Watt-hours. In its simplest terms, Watt-hours is an expression of Voltage x Current. This is a more precise measure of the amount of energy in a battery packs than milliamp-hours (mAh), as it takes into account both voltage level and current draw during the discharge of the battery. This refers to the Lithium Ion chemistry's low self-discharge rate as compared to that of Nickel Cadmium. Say what?? Have you ever charged a NiCad pack, then put the charged pack on the shelf for a few weeks or months before you needed it? If so I bet you noticed that the pack was not fully charged when you went to use it. That's because Nickel Cadmium cells lose charge over time just sitting idle. So do Lithium Ion cells, but the rate of loss is 4X slower. So after sitting for a month or two unused a NiCad pack may seem nearly discharged while a Lithium Ion pack may still seem nearly fully charged. Which batteries are compatible with my tools? 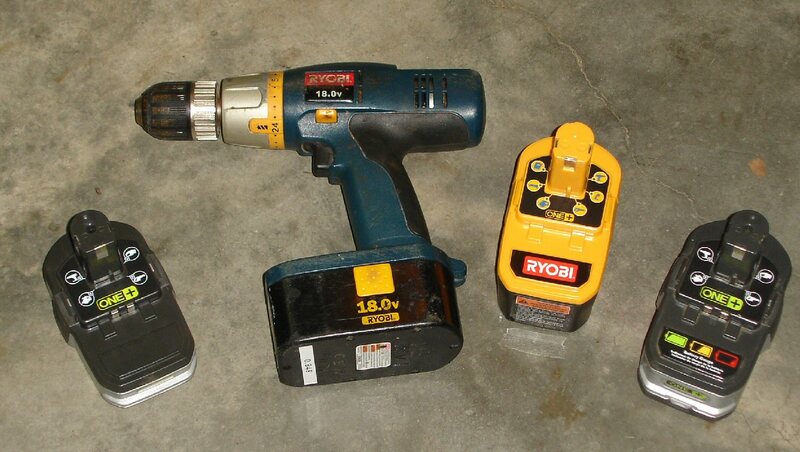 As far as I can tell, any 18v Ryobi battery will work with any 18v Ryobi tool. 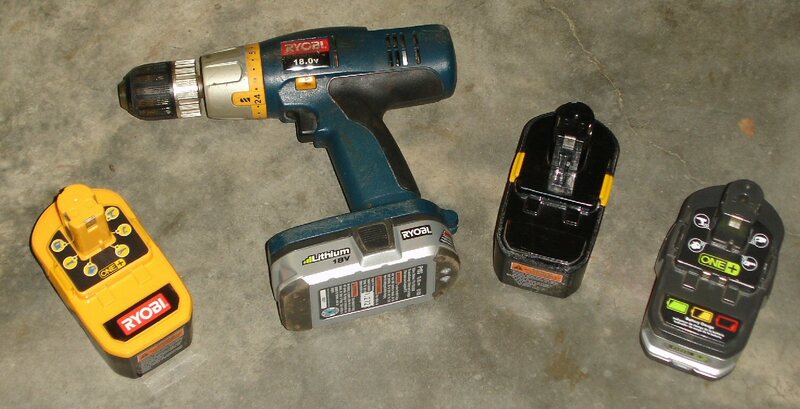 See the photos below to see each of the four battery types plugged into an old drill. Do the serial numbers mean anything? Yes! All Ryobi batteries (and tools) are stamped with a date code, and newer batteries have a serial number. The date code indicates when the battery was manufactured. The first two digits are the year and the second two are the week of manufacture. Some batteries may have one or two letters before the four numbers, not sure what they mean but my guess is the site of the factory. In 2012 Ryobi started printing a 2D barcode on each label which is encoded with the manufacturer part #, serial number, and model #. I want to buy NEW batteries, but everything in the store is at least 3 months old! What's up with that? It's perfectly normal to visit The Home Depot, check date codes, and find that everything on the shelves was manufactured several momths ago. Why? Let's not forget that Ryobi tools are manufactured in China. They're sent to the USA via boat, whose transit time can be a couple of months. While I have no knowledge of the actual process, I might expect additional delays. For example, the Ryobi factory probably manufactures a tool or kit in a "run" which lasts for several weeks. The items manufactured in the first week(s) may sit around until enough product has been produced to make a full shipment. Additional delays are likely at the shipping ports in China and in the USA, and of course some time is required for distribution. Tools manufactured for a special event sale (Memorial Day, Father's Day, Black Friday) may be held a little longer so they appear on shelves on the day that these sales begin. Without making a heroic effort, I doubt that new Ryobi tools can reach the shelves of The Home Depot in less than 2 months from the date of manufacture. Based on my personal observations I'd say that 3 months (or more) is typical for the factory-to-shelf process. Hey! I just bought some new batteries and the date code says they're 9 months old! Is that a problem? Not necessarily. These batteries are designed to sit on the shelf for months before sale. I have no hard data to support this, but I suspect that "new" batteries up to a year old or more are still 100% fine. Even still, when I go to The Home Depot I always check the serial numbers printed on the tool package before I buy (especially if the package contains batteries) and I'll always select the newest ones. 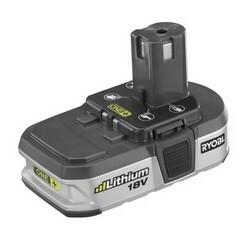 Ryobi ships all batteries with a low charge, and all batteries self-discharge over time. When the voltage on Lithium Ion cells gets too low the cell begins to deteriorate. This phenomena doesn't really occur to NiCad batteries. NiCad packs are very resistant to problems when sitting on the shelf with a low charge for a long time. NiCad packs that are 18 months old or older may test lower than expected on the first cycle, but after 3-4 cycles they should recover back to like-new performance. Lithium Ion packs DO NOT like to sit idle on the shelf with a low charge for a long time! After 9 months or more on the shelf in the store or warehouse the deterioration of Lithium Ion cells can begin. That's why I would not purchase a Lithium Ion battery that's more than 9 months old. Update 13-Apr-2010: Beware of new old stock P104 batteries! I've found that "new" P104 batteries taken from old kits (more than a year old) are often dead or operate at a greatly reduced capacity. I recommend avoiding the purchase of kits containing P104 batteries that are more than a year old. Batteries with a date code between and including 0821 to 0832 have had an especially high DOA rate. If you do purchase new old stock P104s, test them immediately using the "flashlight test" or other means to ensure that they are operating properly. Exchange or return the batteries if they're not OK! Last week I received some CS1018 batteries (1st week of May, 2010? ), These are the most recent date codes I've seen. The behavior of the built-in tester has now changed a bit. Ryobi has now built a 2-3 second delay into the formerly momentary check-while-you-hold-the-button device. So press the button for just a moment and it stays lit for 2-3 seconds for you to read it. Not a big deal, but it's clear that Ryobi are continually changing their products. The batteries in my new kit take a charge. Should I assume that they're all OK? Absolutely not! The kit may have been new, and the batteries may take a charge, but that DOES NOT MEAN that your batteries are working as they should. 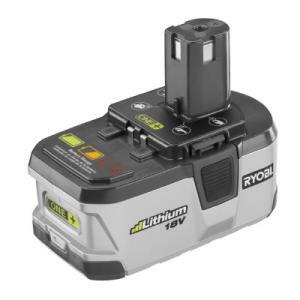 I have purchased literally hundreds of Ryobi kits containing batteries, and I can tell you from experience that "New" does NOT necessarily mean that the batteries are in good working order, even if they take a charge! ALWAYS test your batteries soon after you open your kit! The sooner you test them, the greater the chance that you will be allowed to return/exchange your kit should you find a problem. If you buy a kit containing P104 batteries that's more than a year old, you should expect problems. Period. When you open the kit I suspect that the batteries may or may not take a charge. If they do, I'd expect their capacity to test below 50%. 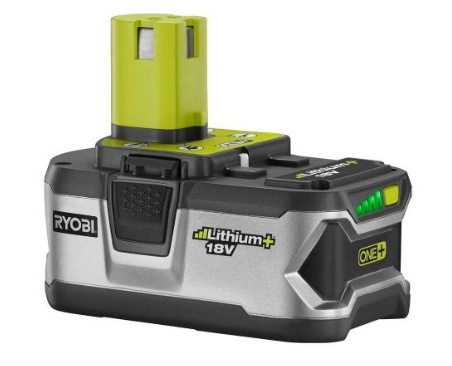 I know that Ryobi discounts discontinued tool kits when they're about a year old, and I suspect that Ryobi (and other makers who do the same) count on consumers not realizing that the batteries are no longer good. Let's face it, if the battery takes a charge and comes from a "new" kit, then the average consumer will think that it must be good, right? Wrong. 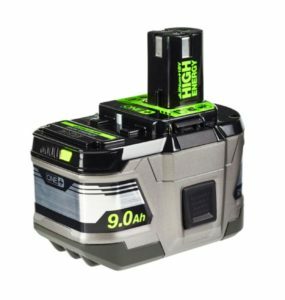 I further suspect that some of the negative reviews given by first-time buyers of cordless tools who mention poor battery life and performance are actually consumers who purchased a kit containing bad batteries, and because they have no "new" reference packs to compare against they don't realize that this is what has happened. As above, kits over a year old containing P103 batteries are also likely to have batteries which can no longer operate at full capacity. Case in point: I recently purchased two P542 chainsaw kits, each containing a P103 battery that was 70 weeks old. The batteries would not test over 900mAh even after several cycles. Otherwise they were fine. These old stock batteries wll never operate above 70% of their rated capacity. An uninformed consumer who purchases such a kit may simply think that this is the best a P103 can do. The story with NiCad batteries is not the same as with Lithium Ions. New old stock NiCad packs seem to show a diminished power at first, but recover well after a few cycles. For example, I received two new old stock P100s recently that were 86 weeks old(!!). After the first charge they tested just under 1000mAh, but the discharge curves did not contain the telltale stairstep of bad cells. So I cycled them and retested, getting about 1200mAh the second time. I decide to go once more and got about 1360mAh. A few more cycles and they'll be fine. Is there a "Quick Check" I can do in-store to see if the batteries in an old, discounted kit are still OK? Maybe, and this would work only for Lithium Ion batteries (P103 and P104). Open the kit and press the battery tester on the P104. If it lights up to any color at all, the pack is probably OK. Carry a P150 Fuel Gauge with you into The Home Depot and use it to test P103 packs. Why would this be an adequate "Quick Check"? I have a theory that I haven't quite proved yet, but well here goes. We know that the irreparable damage occurs to Lithium Ion cells only after the cell voltage has self-discharged below a certain threshold. And we know that the pack's self-protection circuit kicks in and disconnects the cells before the cells have discharged below this lower threshold voltage. So my theory is that if a pack can light up a battery tester, then the cells must not have discharged below the lower threshold yet, and must therefore still be "good". The pack could still be faulty (e.g., one cell has died while the others are OK enough to light the tester, or bad circuit board). 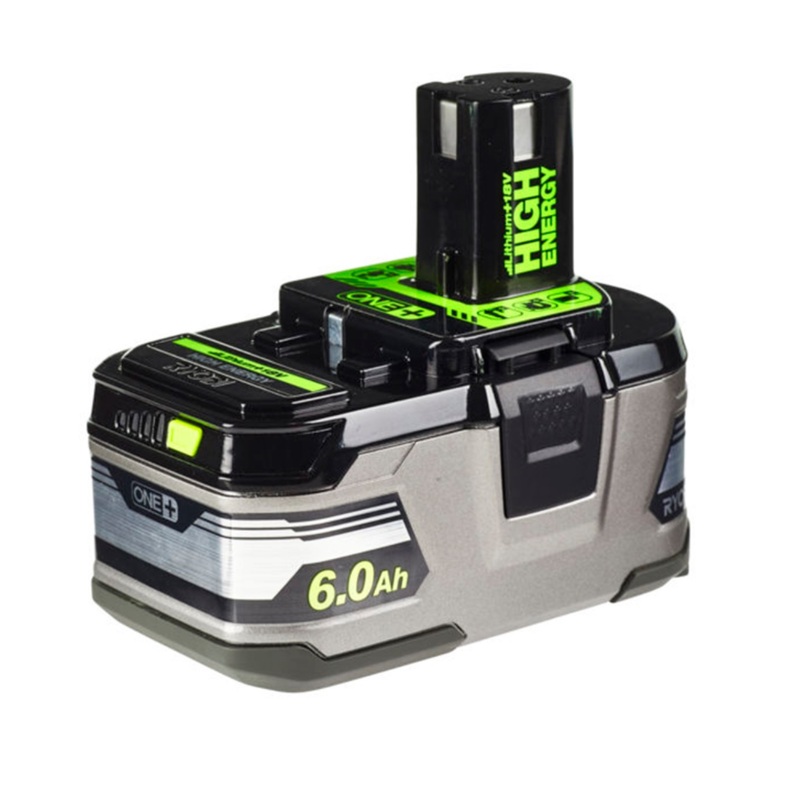 But if the tester won't light up at all, the pack almost assuredly has problems and you should either pass up on the deal altogether or be prepared to return later with the faulty battery for an exchange. How should I store my batteries when they're not in use? Keep them plugged into an IntelliPort Charger all the time, such as the P114, P115, P116, P117, or P126 SuperCharger. The IntelliPort Chargers are designed to keep batteries at a full charge without ever overcharging. If you don't have an IntelliPort charger, or (like me) have more batteries than chargers, then read on. DO NOT leave your battery connected to a charger while the charger is unplugged -- when unplugged the charger will actually discharge and potentially damage a battery pack. NiCad batteries will degrade in performance if left idle for a long time with a charge on them. That's because dendrites form across the plates when in the presence of a charge. These dendrites are like little jumper wires that short out a cell. This phenomenon is often observed as "memory effect". One can usually "burn off" an accumulation of dendrites by putting a huge charge across the plates of a cell. Some folks advocate momentarily connecting a pack to a large voltage source to burn off dendrites. This does work, but also decreases the overall capacity of each cell each time it's done because it also leaves holes in the plate surface area (where each dendrite had been located) and cell capacity is a function of the total surface area of the cell. To avoid a buildup of dendrites, once can completely drain a NiCad cell and then short it out and store it in a cool, dry place to prevent a charge buildup. This works. Unfortunately this applies to the storage of single cells and does not translate well into the storage of a multi-cell pack such as the P100. In a multi-cell pack it's very difficult to ensure that every cell in the pack has been completely discharged, and simply discharging a pack is sure to result in the "reversing" of several cells as the pack's overall charge reaches zero. Cell reversing is generally more harmful than dendrites, so avoid this if possible. What does this mean for NiCad battery storage? Unfortunately not much, but I thought I mention it all so folks could get an understanding of what's going on in a NiCad pack like the P100. The best advice I can give on NiCad pack storage would be to fully charge them before putting them away for storage. Then store them in a cool (55F to 75F) and dry place. I would further recommend that you discharge then recharge them ONCE PER MONTH. Mark your calendar if you need to. An idle pack will develop dendrites over time, so the best way to avoid this is to USE THEM periodically. I recommend using a flashlight, just plug the battery in and leave it on until the battery is depleted, then charge the battery and put it back into storage. It's a pain, but NiCads really don't like to be left alone for extended periods of time. Lithium Ion packs degrade in performance when the charge on a cells goes out of the service range. This range is about 2.8 volts to 4.2 volts. Ryobi packs have five cells (P103) or five pairs of cells (P104) in series, for a safe voltage range of 14v to 21v. Sitting idle, packs can only discharge (slowly) so the best way to store these packs is to give them a full charge before storage. If left with a full charge, it should take more than a year before a Lithium pack will self-discharge enough to drop below 2.8v on a cell! I'd still recommend topping off the charge on an idle pack periodically (once every 6-12 months?) but there's no need to discharge them first like with the NiCads. I've changed my opinion somewhat on how to use and store Lithium Ion batteries, based on the results of studies carried out by Battery University. Of the various results, one can see that the number of cycles a battery can deliver can be increased significantly by not fully charging or discharging the cells, and by not storing the cells at extreme temperatures. I'm talking 2, 3, 4 or more times as many cycles per battery! Battery University reports that for maximum longevity, batteries in long-term storage should be kept at a 40% charge. This is difficult to achieve with the available tools, since a Ryobi charger will bring a pack to 100% charge. The older chargers will trickle charge packs when they reach a full charge, keeping them at 100% charge continuously and which will decrease the pack's recoverable capacity (by 20%/year?). But an Intelliport charger stops charging when a pack reaches a full charge, allowing the pack to self-discharge a bit. After a period of time the charger "wakes up", checks the battery, and tops it off. This behavior is actually quite beneficial to the longevity of the battery. But it still keeps packs near a full charge, which is not ideal. If you're really serious about the longevity of your Lithium Ion batteries, then you should actively monitor your use of them. Try to avoid fully charging and discharging them. If you have a battery with a meter (or a P150 pocket meter), try to stop using your battery when you're down the the last bar. And don't allow the battery to reach a full charge -- pull it off the charger when the fourth bar gets illuminated. Finally, avoid exposing your battery to extreme temperatures. Keep your batteries stored in your house, not in your vechice or in the garage (which can get very hot or very cold). Of course, for many of us the advice in the preceding paragraph will be very difficult to follow. 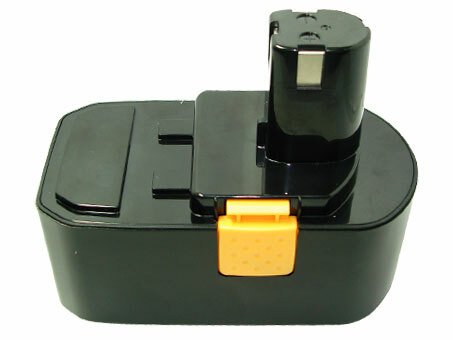 To simplify: swap the battery you're using more often to avoid fully discharging any of them, get an IntelliPort charger or quickly remove your batteries from older chargers once the charge is complete, and always try to keep your battereis in the house (even if you kep the rest of your tools in the truck or garage). Which battery pack do you recommend? First of all, I recommend having two or more packs and a one hour charger if you're doing anything that drains a pack before you're done with the job. Then you can swap packs, put the drained pack on the charger, and get back to work. If you already have a P100 NiCad pack and a one hour charger, then getting a second P100 pack would be your least expensive option and a reasonable one. I've now made the switch to Lithium Ion and I'm not looking back! I use mostly P108 packs, sometimes P103. 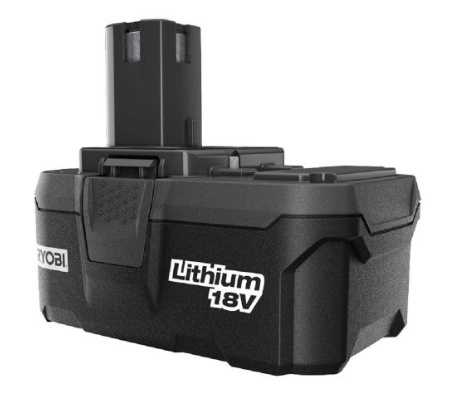 If you have the need for more or new batteries and have the money to buy them, I recommend going with the Lithium Ions over the NiCads. I feel that per charge they do last longer than the NiCads and they can sit on the shelf between jobs without needing to recharge before use. And for single-handed tools the weight difference can be noticeable. 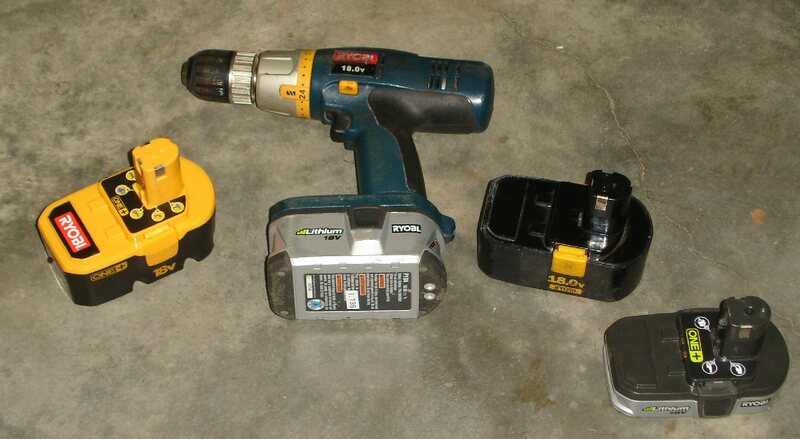 I find that I usually reach for a compact battery when I want to use a flashlight or a drill. 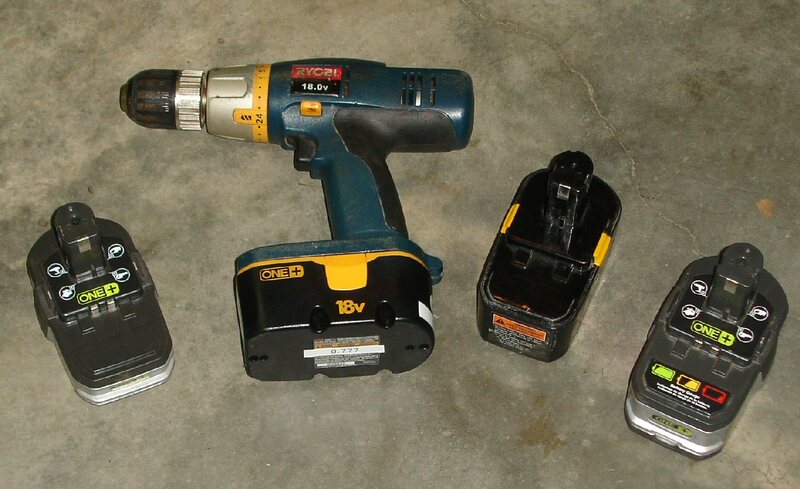 I use a full-height battery with the reciprocating saw, canister vac, and yard tools. I've made the switch to Lithium Ion. Any reason to keep using NiCads? Well, there's no reason to throw out good batteries, period. But actually, yes, there might be some very good reasons to continue using NiCads. If you work in a very cold environment, NiCads might be a better choice than Lithium Ions because you can recharge them when cold. Lithium Ions will not take a charge if too cold. If you need to push your tools to the limit with maximum torque, then NiCads may be the best choice for you. That's right, if you need every bit of torque from your drill as it slowly crawls that spade bit through wet lumber, NiCads are for you. Why? It's because the Lithium Ions contain an internal protection circuit that cuts them off when pushed to the limit like this. NiCads do NOT have such a circuit, so you can push them as hard as you need to. I don't measure 18 volts across my P108 battery. What's up with that? 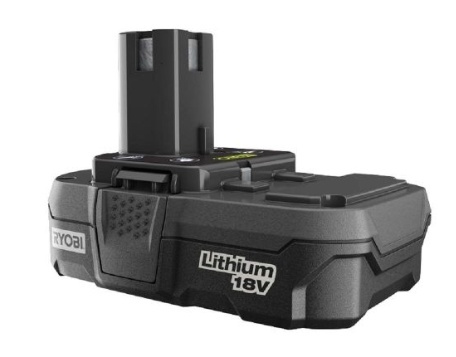 Ryobi's newest batteries, the P107 and P108, are being marketed as "Lithium Plus". I'm not sure what this hype means, but they've apparently changed the internal circuit board design. As a result, the voltage at the terminals remains low until a load is detected. When used with most tools, you'll never notice the difference. But if you use a P740/P741 radio you may find that the radio doesn't come on when you press the power button. The quick fix is to press the battery's power level meter first, which briefly "wakes up" the battery. 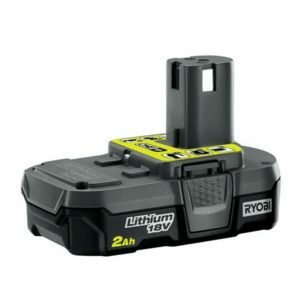 With all other Ryobi batteries, a voltmeter across the terminals will measure the voltage of the pack. This can give an indication of the battery's charge level, much like the P150 Fuel Gauge will do.